"Librarians are information mountaineers, guiding us to high peaks, encouraging us to keep our gaze skyward." Jaime Vandergrift, Co Founder of EduVue, invited me and fellow librarian and friend, Michelle Cooper (Founder of Texas Library Chat #txlchat), to discuss the future of libraries and media/tech collaboration. School librarians are the backbone of your school. They are the "go to" resource for administrators, teachers, students, parents and your school district's technology department. School Librarians are the leaders in all things technology and education related. School librarians can and should be leading professional learning sessions on topics that range from Flipped Classroom to Common Core to the latest educational technologies and everything in between. Libraries are also perfect places for MakerSpaces. Buffy Hamilton, The Unquiet Librarian, wrote a great blog about library spaces as makerspaces. We also discussed the TL Virtual Cafe. 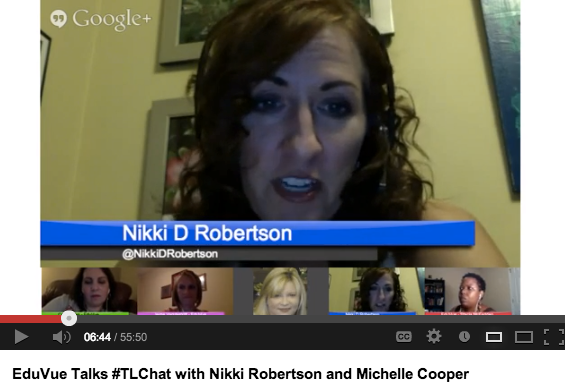 This group presents teacher librarian related webinars the first Monday of each month at 8 pm ET. The founders of the TL Virtual Cafe are Rock Star Librarians that have been amazing mentors to me. I am grateful to be a part of this organization. Sever cuts in funding to school libraries is a tragedy currently affecting many school districts across the country. In Alabama, all state funding for school library aides was eliminated this Spring. This cut came after five years of ZERO funding for school libraries with no end to proration in sight. For most Alabama school libraries this has meant NO new books or supplies. Many other school districts have fired their certified librarians and replaced them with library aides. Others have completely closed their school libraries. This is a tragedy because studies like School Libraries Count have concluded that schools who fund and staff their libraries with certified librarians score higher on standardized tests. Similar to the times that PE and the Arts were cut in budget saving measures, we learned just how valuable and needed these areas were once we no longer had them in our schools. The same with happen with libraries, eventually, but with what cost to our students in the meantime? Click the image above to watch the conversation and fun as we struggle with the new changes made to Google Hangouts. Have you overlooked the amazing resource that is right in your own school? If so, RUN to your library today and start a conversation with your librarian. If you have already discovered this great resource, please BRAG about your awesome librarian below! We would love to spotlight your incredible resource!